Image Size: 21.5 X 11.5 in. As the Flintstones and the Rubbles are set to wage a prehistoric war to see which couple has the cutest kid in town, Pebbles and Bamm-Bamm seem blissfully oblivious in this Limited Edition cel from Hanna-Barbera Animation Art. Directly reproduced from the Flintstones timeless episode “The Most Beautiful Baby in Bedrock”, this hand-painted cel accompanied by a lithograph background reflects the most definitive image of Pebbles and Bamm-Bamm. Each cel is personalized with the signatures of the voices of the Stone Age toddlers for more than thirty years, Jean Vander Pyl and Don Messick. 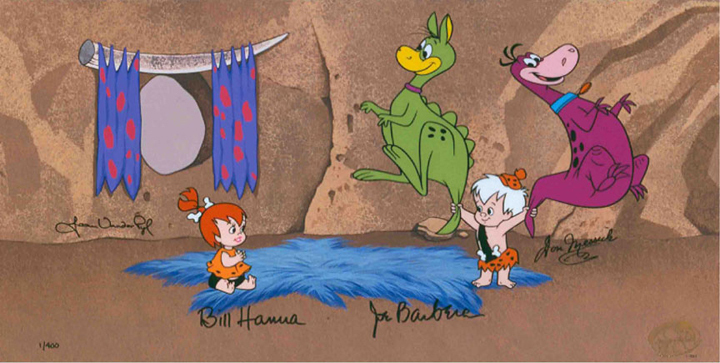 And best of all, each The Most Beautiful Babies in Bedrock is signed by the creators of Pebbles and Bamm-Bamm, Willam Hanna and Joseph Barbera.